In a normal joint, cartilage covers the ends of the bones and allows them to move smoothly and painlessly against one another. In osteoarthritis (or degenerative arthritis), the cartilage layer wears out, resulting in direct contact between the bones. 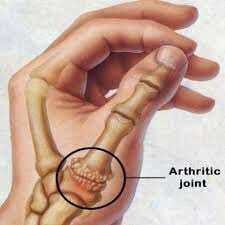 In the hand, the second most common joint to develop osteoarthritis is the joint at the base of the thumb. 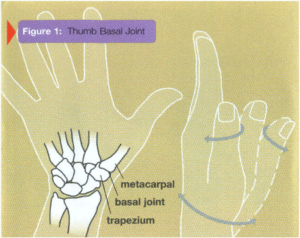 The thumb basal joint, also known as the carpometacarpal (CMC) joint, is a specialized saddle-shaped joint that is formed by a small wrist bone (trapezium) and the first of the three bones in the thumb (metacarpal). The specialized shape of this joint allows the thumb its wide range of movement–up and down, across the palm, and the ability to pinch with the fingers (see Figure 1). The most common symptom of thumb basal joint arthritis is a deep, aching pain at the base of the thumb. The pain is often worsened with activities that involve pinch, including opening jars, turning door knobs or keys, and writing. As the disease progresses, patients may experience pain at rest and at night, and patients often note loss of pinch and grip strength. 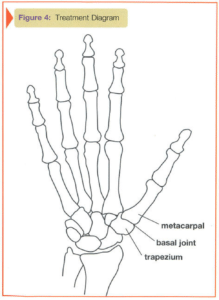 In severe cases, progressive destruction and mal-alignment of the joint occurs and a “bump” develops at the base of the thumb, which is caused by the thumb metacarpal moving out of position in relation to the trapezium. At this point, thumb motion becomes limited and the space between the thumb and index finger narrows, making pinch activities difficult (see Figure 2). The next joint up may hyper-extend to compensate. 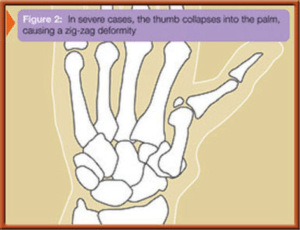 The appearance of the thumb and the location of the pain are usually very helpful in identifying this condition. Applying longitudinal pressure along the thumb and twisting or grinding the basal joint is also helpful in reproducing symptoms (see Figure 3). Although x-rays help confirm the diagnosis, symptom severity often does not correlate directly with the joint’s appearance on the x-ray. Patients with advanced arthritis or who do not respond to non-surgical treatment may be candidates for surgical reconstruction. A variety of surgical techniques are available that can successfully reduce or eliminate pain and improve thumb position and function. Common surgical procedures include removal of arthritic bone and joint reconstruction (joint arthroplasty), bone fusion or realignment techniques, and even arthroscopic procedures in select cases. A consultation with your treating surgeon can help decide the best options for you (see Figure 4).